It is very hard to find flowers in shades of blue. 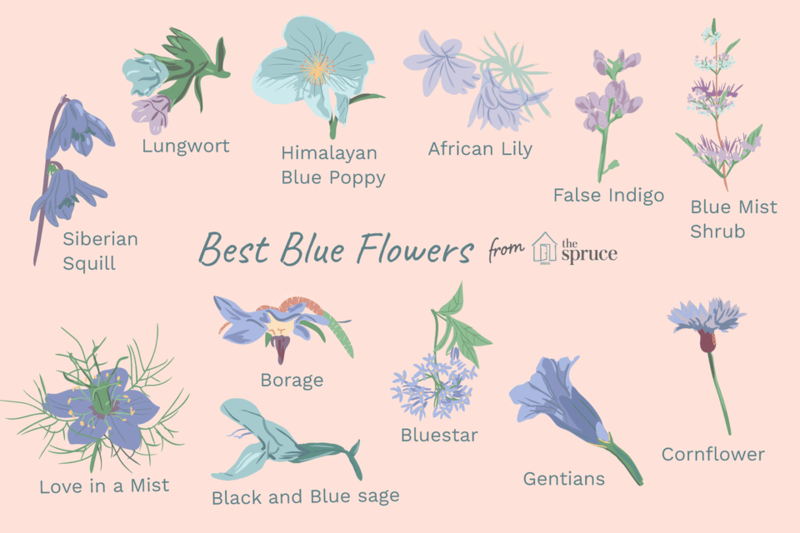 Most blue flowers lean more toward lavender or purple than a true blue. Sunlight also plays tricks on blue coloring and the photos you see in seed catalogs are often not the colors that wind up in your garden. Blue flowers may remain elusive, but the plants highlighted here come darn close, if not right on the money. Keep in mind that when plants get hybridized, they can often change color ever so subtly. So Longwood Blue blue mist shrub might not be as blue as Blue Myth. If you plan on investing in several perennial plants or shrubs, you should try to see them in bloom before you purchase them. You can do more experimenting with annuals since you can often start them inexpensively from seed. 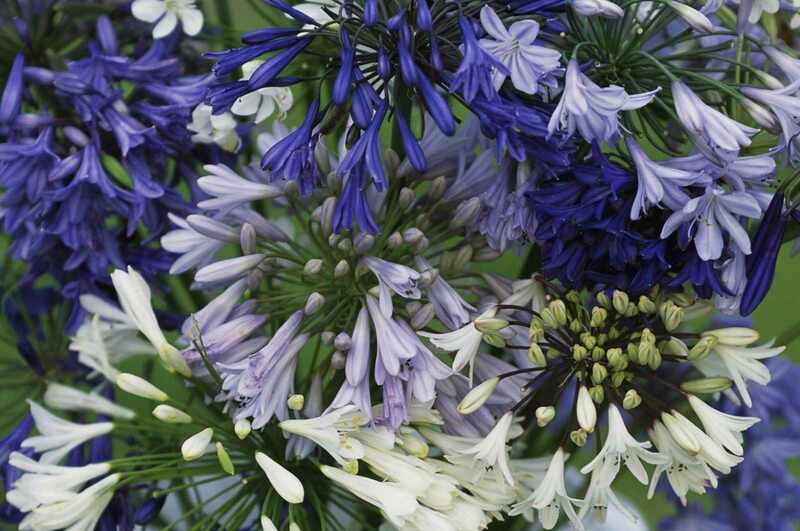 The genus Agapanthus contains about 10 species, all with large clusters of flowers in shades of blue or white. Agapanthus africanus is known as the lily of the Nile, the African blue lily, or just African lily. The flowers are somewhat lily-like. It is a tender perennial, only reliably hardy down to U.S. Department of Agriculture zone 8. It is grown from a fleshy rhizome and can be dug and stored for the winter in cooler areas. The umbels of blooms are held above the grass-like foliage and bloom throughout most of the summer. There are enough species of Amsonia for everyone to find their favorite shade of blue. The fluffy clusters of flowers are comprised of many small, star-shaped flowers, giving this flower its common name, Blue Star. The flowers stay lovely for weeks and even the seed pods are nice. Arkansas Amsonia (Amsonia hubrichtii) was named the 2011 Perennial Plant of the Year. It has deep blue flowers and narrow, lance-shaped leaves that burst into gold in the fall. A close look at the leaves and flowers of Baptisia australis should tell you that it is in the pea family. This is a native American plant that was very popular for making blue dye. Its common name is blue false indigo. Baptisia can be slow to get established, but once it is, it sends down a deep taproot and does not like to be budged. Do not worry, you will love it and want to leave it be. Borago officinalis is an underused plant, which is ironic since it is a member of the forget-me-not family. It is considered an herb with medicinal qualities that include being a diuretic and an emollient. It is also a culinary herb with a scent and flavor similar to cucumbers. The leaves get prickly as they mature, but you will want to let some of them grow to get the lively blue blossoms—also with a mild cucumber aroma. Borage is an easy-to-grow annual that will self-sow. Caryopteris x clandonensis, the Blue Mist shrub, really does create a haze of blue in late summer. When in bloom, it will be covered with buzzing bees that love its nectar-rich flowers. Caryopteris is often considered a sub-shrub, meaning it has woody stems, but the plant blooms on new wood and is cut to within inches of the ground each spring. Other than that, it is maintenance free. There are several cultivars available in various shades of blue. Grand Bleu is a rich dark blue, Longwood Blue (pictured here) is a bright, pale blue and Sunshine Blue has lavender-blue flowers on bright gold foliage. Whether you call them cornflowers or bachelor's button, Centaurea cyanus is one charming wildflower. It got the name cornflower because it grew wild in European corn fields. And the story has it that bachelors would wear one in their lapel when they went courting. The abundant flowers are spiky disks, somewhat resembling thistles without the thorns. It is an annual that will self-sow. Centaurea montana, the mountain bluet, is considered a perennial cornflower. There are over 200 species of Gentians and not all of them are blue, but so many of them are blue that it is impossible to talk about blue flowers and not include them. Naturally, there is a good deal of diversity among the 200 species, but most are alpine or woodland plants that prefer the cooler, wet seasons. Gentiana dahurica (pictured here) is a late season bloomer and tends to sprawl a bit more than other varieties. It has the familiar five-petal, slightly tubular shape of most gentians. Some of the spring blooming species like Gentian alpina and Gentian angustifolia are more mat-forming with tubular flowers. The Himalayan blue poppy (Meconopsis betonicifolia) is a gardening legend. Some even consider it the test of a gardening master. It can be difficult to grow because it is native to the mountains of southeastern Tibet, where it grows in a shady, moist shelter. Not many of us can recreate the climate of Tibet in our gardens, but enough gardeners have had success to make it worth a try. It can perennialize and spread, under good conditions, but even growing them for a single season is worth the treat. The seed packets usually come with detailed directions for sowing, but some gardeners report great success winter sowing these seeds. They all agreed that you have to keep the plants moist. They do not like dry soil. Nigella damascena got the name "Love in a Mist" because of the airy dill-like foliage that surrounds the flowers. Its a freely seeding annual flower that will tuck itself throughout your garden. The plants do not like to be moved, but you can scatter seeds with little effort and they will make themselves at home. The seeds need light to germinate, so you should not cover them. Nigella will flower throughout the season and makes a great cut flower. Lungwort is one of the first plants to perk up in the spring and although not all varieties bloom blue, those that do are resplendent. You may be familiar with the variegated leaf varieties. Some are dotted with white and others are washed with silver. These look good all season, however many of the plain green-leaved varieties have the most brilliant blue flowers. Pulmonarias are shade lovers and look lovely in woodland settings. The striking combination of vivid blue flowers and black sepals on Salvia guaranitica "Black and Blue" are reason enough to try growing it, but it is also a hummingbird and large butterfly magnet. You may see it listed as Brazilian sage or blue anise sage. It is perennial to USDA hardiness zone 7 and can become aggressive in some areas. In cooler zones, Black and Blue is popular as an annual. It is taller than most of the annual salvias and unique in form and color. It may be called Siberian squill, but these tiny bulbs will naturalize in USDA zones 2 through 8. All it needs is a little bit of chill to trigger its winter rest. While dormant, it builds up the energy to reproduce and bloom very early in the spring. It is used to best effect when allowed to spread far and wide. It looks like a sea of blue when naturalized in a lawn. As with most early bulbs, it usually has few pests or problems. It does need moisture while it is growing and drier conditions while it is dormant.